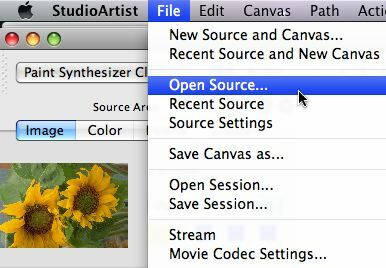 The paint synthesizer allows you to create an unlimited range of different manual or automatic paint tools and effects. You can interactively paint or draw manually via the mouse or a pen and tablet, or press the Action button and the paint synthesizer will analyze the source image and automatically paint in a programmed style. There are a large number of pre-built factory paint presets (over 6000) provided to help you get started using the paint synthesizer. All of these factory paint presets are completely user editable in the paint synthesizer Editor palette. 26 different control panels provide access to over 450 different editable parameters that specify a given paint preset. Paint presets are also additionally user extensible via custom image, movie, bezier path, or live MSG brushes. 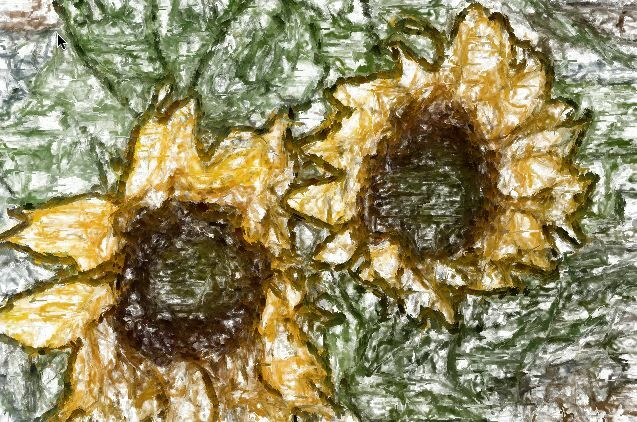 Paint presets can simulate traditional art media or create new and unique digital effects. Extensive use of dynamic procedural texture generators, interactive modulators, and internal visual modeling to drive automatic drawing create extremely organic paint effects and smart intelligent auto-rotoscoping capabilities. The paint synthesizer provides for 13 different pen modes. Each of these pen modes provides a unique approach to manual or automatic drawing. Interactive pen mode draws an interactive single paint stroke in real time. Particle pen mode allows you to paint with a dynamic particle swarm. 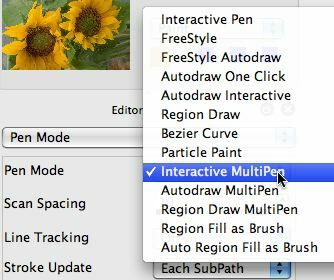 Interactive multipen mode simulates the effects of a multi-bristle paint brush. Region Fill as Brush mode allows for manual or automatic region based paint effects. The best way to understand what the different pen modes have to offer is to choose a specific paint preset and try drawing with it in all the different pen modes. You can adjust the current pen mode in the paint synthesizer Editor in the Pen Mode control panel. The paint synthesizer allows for extensive paint parameter modulation based on things like pen pressure, tilt, tilt orientation, barrel rotation, pen proximity, and velocity. You can also modulate different aspects of the paint based on visual attributes of the source image or canvas area you are drawing on. This means you can create very interactively responsive and expressive paint tools. The best way to get started using the paint synthesizer is to take some time and work your way through some of the factory presets. Individual presets are organized by Category and Collection. 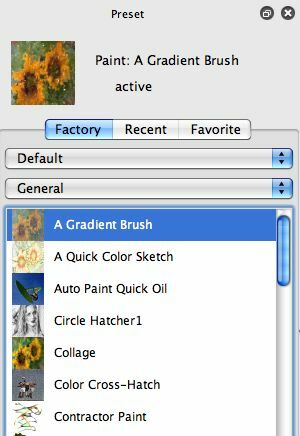 The screen snap below shows the paint presets available in the General category in the Default collection. By using the 2 popups at the top of the preset list you can try out different collections and their associated categories. To select a specific preset to draw with just click on the icon or title. When you do that selected preset will display at the top of the Preset palette in the current preset icon, and the associated title will update accordingly. Once you have selected a specific paint preset, you can either draw manually using the mouse or pen and tablet, or you can press the Action button and watch the paint preset draw automatically. Some paint presets may have been specifically designed primarily for manual or automatic drawing. So as you work through the preset collections you may run into specific presets that seem better suited for one of the 2 different approaches to drawing. Some presets may also be specifically designed to work with a pen and tablet and may be less suited to drawing with a mouse. 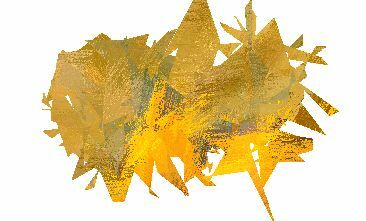 When working through the paint presets, make sure you load a source image into Studio Artist, since the automatic drawing routines will analysis the source image and draw based on that internal analysis and the paint synth parameter settings. You are free to custom organize your paint presets anyway you see fit. The collection and category hierarchy corresponds to the folder hierarchy within the main Paint preset folder on your hard disk. You can make your own custom collections or categories and drag or copy drag presets within these folders to customize the way they are displayed in the Preset palette. You can also make your own custom Favorites categories for easy access via the Favorites preset toolbar. For more information on how to work with organizing and customizing presets check out this tip.